Fork Android and the likelihood that Android sites and enthusiasts are going to care much for your products is slim to none. Take the Nook HD and Nook HD+ as prime examples. When these new tablets were announced back in September, our readers cared enough to drop 16 comments on the announcement post. We realized at that moment that there was no need to talk about these products any longer. Whether you agree with that stance or not, I can tell you that we have not received one email related to either since that day. It is what it is. But today marks a new beginning for the Nook series. Thanks to an over-the-air (OTA) update that will arrive at any moment, both the Nook HD and Nook HD+ will become official Android tablets. Since the update includes Google Play, Gmail, YouTube, Chrome, Google Search, and Google Maps, it’s clear that Barnes & Noble realized the importance of being a true part of the ecosystem. Sure, Amazon is doing quite well with their Kindle line, but they are certainly the exception to the rule. So if you own a Nook HD or HD+, be on the lookout – Google Play is coming your way. New York, New York – May 3, 2013 – NOOK Media LLC, a subsidiary of Barnes & Noble, Inc. (NYSE: BKS), the leading retailer of content, digital media and educational products, today announced it is expanding its extensive catalog of reading and entertainment content with the addition of the popular Google Play digital content experience on its acclaimed NOOK HD and NOOK HD+ devices. With Google Play on NOOK HD and NOOK HD+, customers have access to more than 700,000 Android apps and games, millions of songs and more. Barnes & Noble’s highly acclaimed lightweight high-definition 7- and 9-inch tablets will also include popular Google services like the Chrome browser, Gmail, YouTube, Google Search and Google Maps. Always a great value, NOOK HD, now with Google Play, is available starting at just $199 and NOOK HD+ starts at only $269. NOOK products are available at the nearly 700 Barnes & Noble stores, NOOK.com and leading retailers. Google Play and the other Google services will be available to all new and existing NOOK HD and NOOK HD+ customers in the US and UK at no cost through an automatic over-the-air update that will roll out to all devices connected to Wi-Fi beginning today. Customers who would like to enjoy the major new software update immediately can learn more at www.NOOK.com/support or www.NOOK.co.uk/support. More than 700,000 Android Apps and Games: Choose from more than 700,000 great apps including Facebook, Twitter, Pinterest, Temple Run, ESPN, TED, Netflix and so many more, all ready to enjoy right away. The NOOK Store™ continues to feature a wide selection of thousands of high-quality NOOK Apps™ tailored for the devices including the highest-quality educational apps for kids through age 12, all organized by subject area and easily searchable. Millions of songs: The addition of Google Play Music lets customers browse millions of songs, discover new artists and fill NOOK HD and NOOK HD+ with favorite tracks to enjoy anytime. Google Play also lets people store 20,000 songs from their personal collection in the cloud for free and stream them to their NOOK HD, NOOK HD+ and other devices. Favorite Movies & TV Shows: Choose from thousands of movies and TV shows including new releases, the latest episodes, award-winning films and past seasons from favorite TV series. Stream movies and TV shows to watch instantly on NOOK HD and NOOK HD+ or make them available offline to watch later, even when not connected to Wi-Fi. 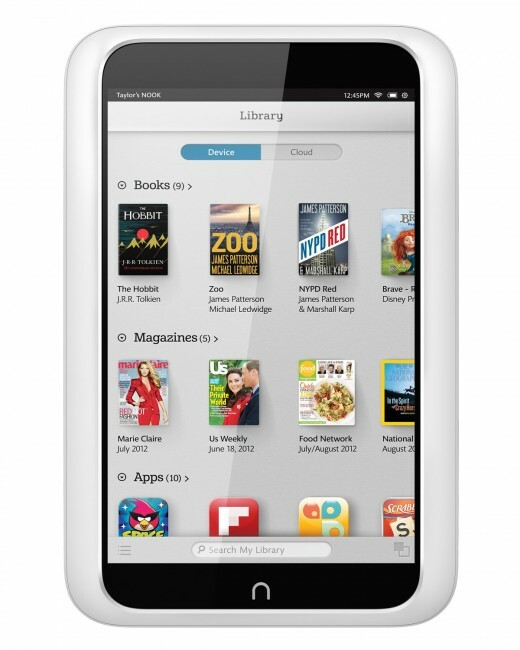 The Very Best in Reading: The NOOK Store offers millions of books and magazines to choose from. Sample any book free or choose from over 1 million free titles. Barnes & Noble offers thousands of best-selling magazines and newspapers from around the world, all in spectacular HD and delivered right to NOOK as soon as they come out. Enjoy free 14-day trials on any newsstand title and get expert recommendations on what to read next from the reading specialists at NOOK through NOOK Channels™. With NOOK Catalogs™, browse top catalogs like Pottery Barn and L.L.Bean delivered right to the device and virtually tear out magazine and catalog pages and save them in a NOOK Scrapbook™. Faster Web Browsing with Chrome: As Web browsing continues to be among the most popular tablet activities, NOOK HD and NOOK HD+ now feature the Chrome browser for fast start up and page loading and an unlimited number of tabs open at once. Customers can even sync bookmarks across any device with Chrome. Google Search™, Gmail™, YouTube™ and Google Maps™: Customers will have instant access to Google Search, Gmail, YouTube and Google Maps, now built in to NOOK HD or NOOK HD+. Sync calendars across multiple devices and check email from any account including Exchange, Yahoo! and Hotmail. Stunning HD Displays: Crisp text and beautiful graphics make books and magazines stunning to read. With NOOK HD’s highest resolution of any 7-inch HD tablet and Full HD at 1080p on NOOK HD+, videos and games look life-like from any angle, with rich color, deep contrast and minimal glare. Light and Portable: Weighing in at only 11.1 ounces, NOOK HD was designed to fit naturally in an adult or child’s hand for hours of enjoyment. And at just 18.2 ounces, NOOK HD+ is the lightest tablet of its kind – more than 20 percent lighter than iPad 3 – making it the perfect companion for movie watching, long reads, Sunday crosswords or favorite games. Expandable memory on the evices and free unlimited NOOK Cloud™ storage for all NOOK content. The NOOK Store offers more than 3 million titles in the US, with 2.5 million available in the UK, including more than 1 million free titles. For more information on NOOK HD and NOOK HD+, or any of NOOK’s innovative products and devices, customers can visit www.nook.com or www.nook.co.uk. Barnes & Noble, Inc. (NYSE:BKS) is a Fortune 500 company and the leading retailer of content, digital media and educational products. The company operates 677 Barnes & Noble bookstores in 50 states, and one of the Web’s largest e-commerce sites, BN.com (www.bn.com). Its NOOK Media LLC subsidiary is a leader in the emerging digital reading and digital education markets. The NOOK digital business offers award-winning NOOK® products and an expansive collection of digital reading and entertainment content through the NOOK Store™ (www.nook.com), while Barnes & Noble College Booksellers, LLC operates 678 bookstores serving over 4.6 million students and faculty members at colleges and universities across the United States. Barnes & Noble is proud to be named a J.D. Power and Associates 2012 Customer Service Champion and is one of only 50 U.S. companies so named. Barnes & Noble.com is ranked the number one online retailer in customer satisfaction in the book, music and video category and a Top 10 online retailer overall in customer satisfaction according to ForeSee E-Retail Satisfaction Index (Spring Top 100 Edition).